We all know that leading a healthy and active lifestyle is in our best interest. We also know that it’s hard to get started and stay motivated to keep the commitment to ourselves to make important changes in our lives. SWSCD is the perfect companion to help you get started and keep you towards a healthier and more active lifestyle. Check out these tips along with the tools you need to succeed. The old adage to keep it simple really applies here. You are more likely to stay committed to a new activity if you see results. So set yourself up for success by establishing some realistic and achievable goals right from the beginning. Essentially, adults need 150 minutes per week of moderate to vigorous intensity aerobic activity per week. The guide also provides information on the benefits of being active – further motivation to get moving. Make a commitment to yourself and start off slow with an after dinner walk. Increase the intensity or find a more challenging activity when you are ready. As you see improvements in what you can achieve, revisit your goals and add in some new challenges. Seeing results is a huge motivator – so keep it simple, revisit your goals and track your progress. If you are doing something you enjoy, you are much more likely to stay committed. What type of person are you? Can’t stand the gym? Are you social? Need some tough love? Have no time? On a tight budget? Need a challenge? Easily bored? WebMD’s “Fitness: Choosing Activities that are Right for You” article provides a good list of questions to help every type of person explore the right type of activity to get you moving. Often, the right activity is out there but you either haven’t heard about it or need to know more. Or maybe, you’re just itching to try something new. 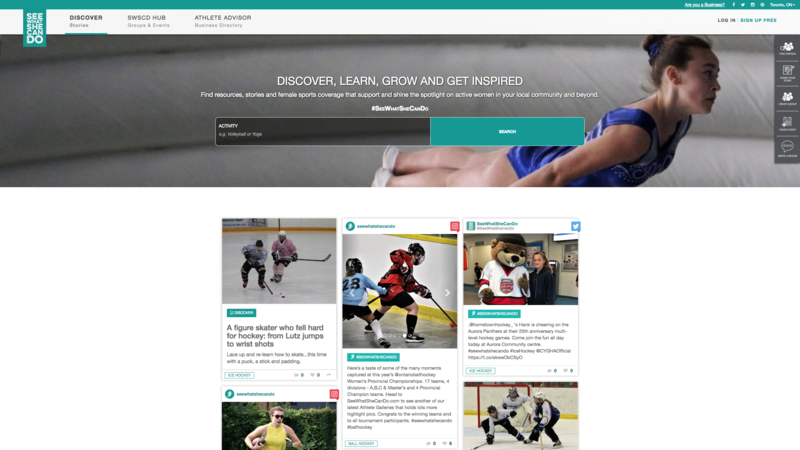 SeeWhatSheCanDo’s Discover blog is packed with inspiring member stories, live event coverage and expert know-how articles to help you get started with a new activity or hone skills for one you’re already passionate about. Part of our hesitation to start something new is often the upfront investment in equipment for a program with an unknown organization. The best way to give a new activity a go, is to find a try-it clinic or trial membership and see what others have rated the service provider. This will give you the chance to decide where to make your investment. 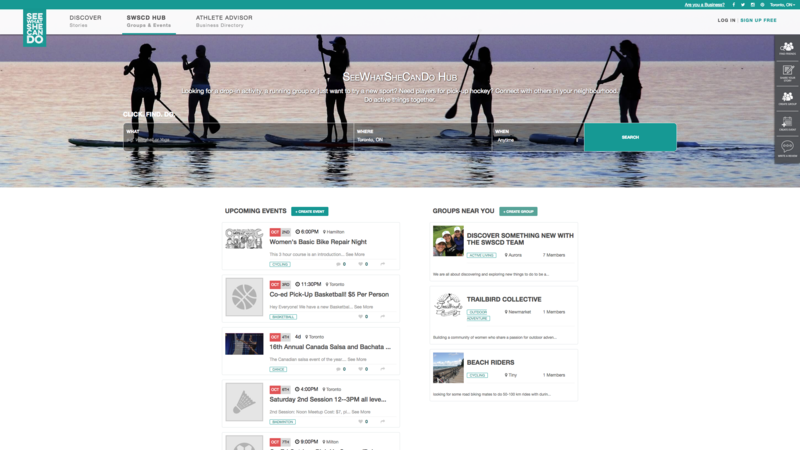 SeeWhatSheCanDo’s Athlete Advisor is an online business directory for all things active. 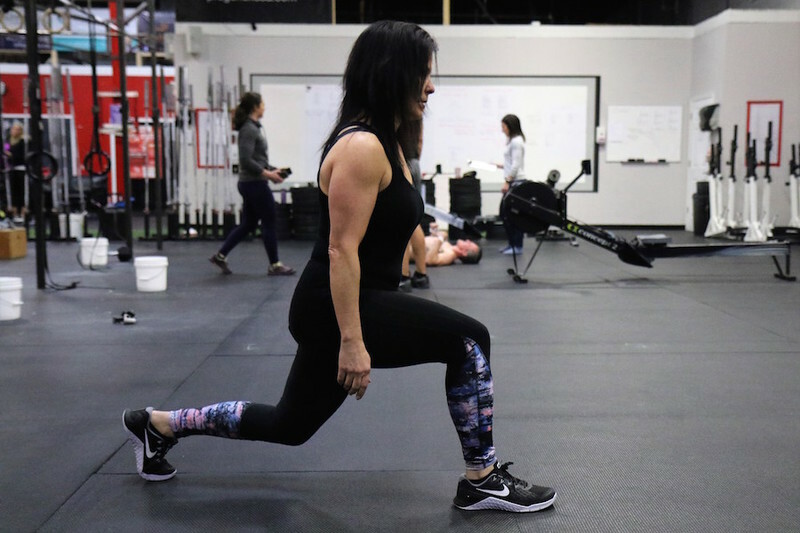 See how others have rated and reviewed an athletic service provider, facility or program, and find free trials to give it a go with no risk. One of the best ways to stay committed is to find a friend or better yet, a group of friends to do your activity with. SeeWhatSheCanDo is your link to like-minded people in your community. From solo to coed, to family and partner-oriented activities you’ll find it all our SCWCD Hub. Explore groups and events or start your own. No league in your community? Craving an active weekend away with friends? Organize your own SWSCD group. Our SWSCD Hub makes it easy to start and manage a group so you can communicate, post events and updates with league leaders and teammates. Here you’ll find groups of all shapes and sizes for any activity you can think of – weekly walking groups, drop-in programs like shinny, golf and dinner nights, tournaments, information sessions and more. Becoming and staying active will require some care and attention. SWSCD will provide you with the tools you need to succeed. 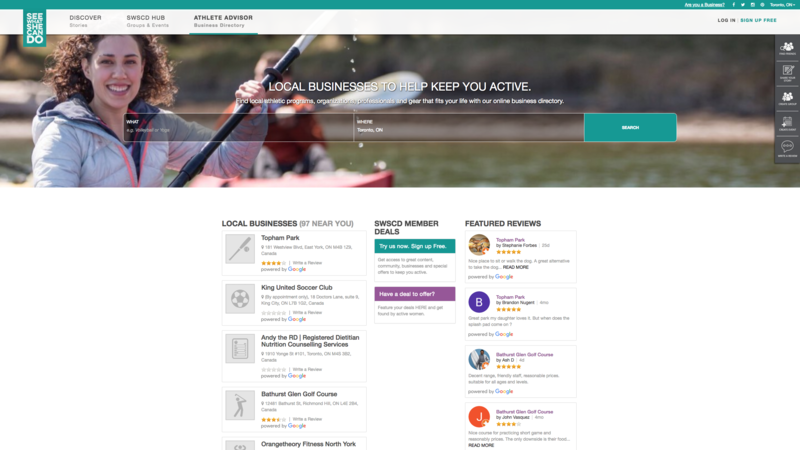 Check out Athlete Advisor – your online business directory for all things active. 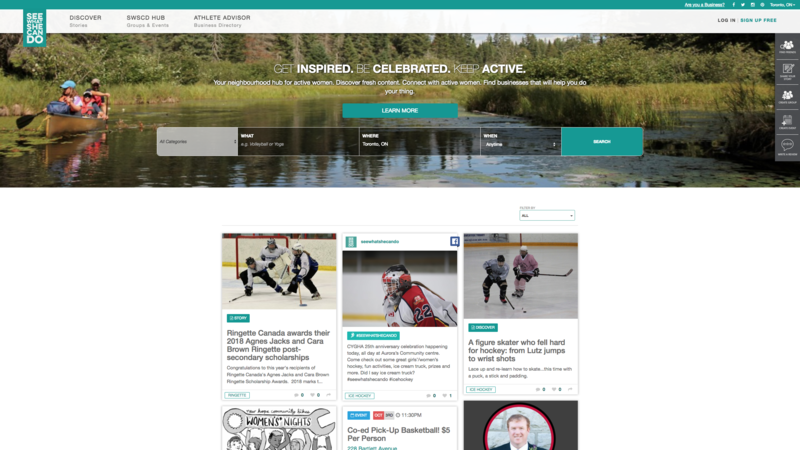 Rate and review your favourite facility, program or camp. See what others have to say about the ones you’d like to try. Find or start a group or event. Organize a retreat, tournament or try-it session. Visit our SWSCD Hub. Explore fresh thinking, inspiring articles on any activity you can think of in our activity pages. Share your story about something you’ve tried recently – whether you are new to a sport or a seasoned pro – directly on our Discover blog or by using #seewhatshecando in your social media posts. We want to hear how you DO.